Delphine Metcalf-Foster has a distinguished military and civilian service career. She began her military career in the Army Reserves in 1979, and retired in 1996 as a First Sergeant. Metcalf-Foster is a combat veteran of Desert Storm/Desert Shield and also served in Southwest Asia. She concurrently worked as a Quality Assurance Specialist for the Department of the Navy for twenty years. Metcalf-Foster continued to hold positions in military organizations once she retired. Shortly before she retired she became a member of Veterans of Foreign Wars, an organization she contributed to for over 23 years. She was also the Commander of the California Disabled American Veterans, a position never previously held by a woman. 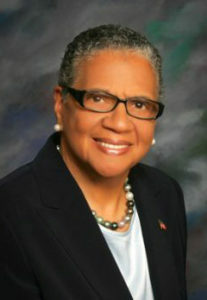 Her involvement in Veteran Organizations resulted in Congressional Representative Miller naming her Veteran of the Year in 2009. During this time, she also served as a Board Member on Congressman Miller’s Military Academy Selection board, interviewing candidates. Currently Metcalf-Foster is a Board Advisor for Women Veterans Advisory Committee, where she advises the Secretary of the VA on women veterans’ needs. She is also an Advisor for Women Veterans’ Connect, where she provides peer mentoring. Metcalf-Foster believes in training younger generations, and spends time weekly reading to kids in the Vallejo, CA library. Her influence on younger generations is evident – her granddaughter SSG Hogan has completed multiple deployments.